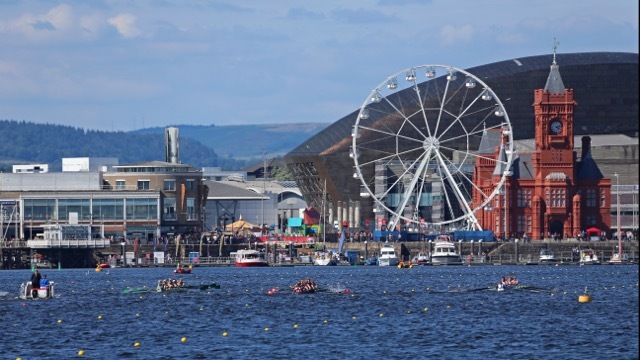 WALES raced to a high five of event wins on a sun-drenched Cardiff Bay, as the Home International Regatta returned to the heart of the capital. Alice Baatz and Steph Clutterbuck took two titles each for the hosts, as big crowds alongside the barrage lock to Mermaid Quay course cheered on home crews in the annual Home Countries ‘Battle of the Blades’ Regatta. 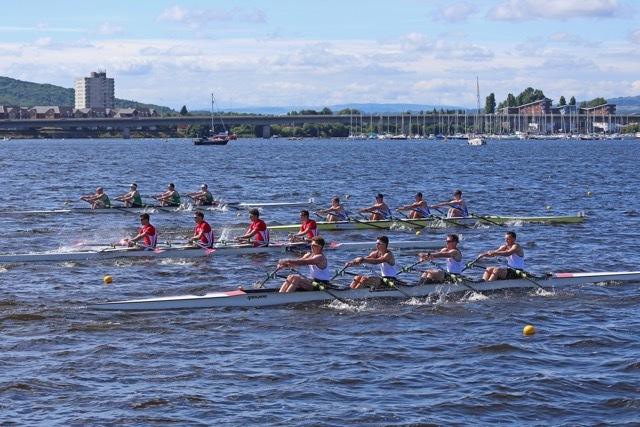 And racing in testing crosswind conditions that made for choppy water, Welsh crews rewarded them with victories in women’s and men’s single sculls, women’s coxed fours, lightweight men’s double sculls and women’s quadruple sculls, plus five second places. Baatz got the ball rolling in women’s singles, going through 500m a few feet up on Ireland’s Marie Pigott, before stretching away to win by a length and a half. And the Bangor University graduate said: “We had a restart (after a false start), and was third the second time away behind Ireland and England, but then began to move through in the middle. “I got about a length or so up, but you can’t ever think you’ve got it until you cross the line, especially in rough conditions like that. In the very next race, Oxford Boat Race Blue Josh Bugajski was defending the men’s singles crown he won on Glasgow’s world championships lake last year. But it looked like a tall order for the Cardiff University graduate after a bad start left him trailing by clear water early on, until an incredible last few strokes saw him grab victory on the line by just four feet from England’s Seb Devereux, right in front of the Welsh Assembly Building. “That was an absolute humdinger, coming through right at the end to retain my singles title. It feels great, very hard, but worth it in the end,” said a delighted Bugajski. “It was really choppy water, with a lot of dodgy strokes, but everyone else was in the same position. I think it rattled a few people. “But the Oxford Blue Boat often sought out the worst possible water to row in, so I wasn’t too worried. “It’s not a traditional way to win for me in the single scull coming through right at the end, but with Oxford we also did a lot of that sort of practise, of being down and pushing past. “I felt a bit of pressure beforehand, as I’ve never failed to medal in my four previous Home Countries and Commonwealth appearances for Wales,” he added. “And I had a bad start, and with the crosswind was about 45 degrees off course just before the starter said ‘go’. “I was about a length and a half down before I started racing, but I kept creeping back and had got back to a length with 500m left, and then really attacked and took him by surprise, pulling level in about 10 strokes. And then it was an all out sprint to the line, but I just got there. Wales’ scratch women’s four of Helen Roberts, Hannah Foxley, Grace Hockenhull, Steph Clutterbuck and cox Sarah Davies added a third title for the host nation, leading from the start and powering home two lengths clear of second-placed England. Cardiff University graduate Roberts said: “The race plan was to stick with the pack and then make our move, but we were up pretty much straight away. We handled the conditions really well and kept it long. “It definitely tastes even sweeter that we’re a scratch boat. It just shows that we really wanted it and were prepared to really work together. “And it was amazing to win in front of so many people in front of the Assembly building, especially as I rowed in Cardiff on the Taff for six years and it’s my first time in Wales colours on the Bay. It’s spectacular, winning here. Cardiff Metropolitan graduate crew mate Foxley added: “We only had one outing the day before, one lap of the track, which makes it even better. And Wrexham-born Hockenhull said: “We said draw it off the start and get the pressure down, and after about 10 strokes we were pulling away. Wales men’s captain Stephen Griffiths from Monmouth marked his fifth appearance in Welsh colours by sealing his first title, with Sean Blake in the men’s lightweight double sculls in similarly commanding style, coming home just over a length clear of Scotland. The 22-year-old, whose father John rowed for Wales and Great Britain, said: “It feels fantastic to finally secure a win after some close seconds, particularly on home water. “It was really choppy on the start, but after being blown all over the place in my single, we got it just right pointing the boat into the crosswind, and when the starter said go, we’d drifted right on line. Cardiff Metropolitan graduate cremate Blake, 25, added: “We’re a scratch boat so we’re pretty happy about that. We went off nice and hard and got onto the rhythm and moved on and just kept squeezing through the middle. Baatz and Clutterbuck then made it a double of personal success, as they teamed up with Cardiff University graduate Beccy Girling and Rachael Davies to take the women’s quad sculls. The quartet took control in the middle of the race to come home just over a length clear of England. Men’s junior double Ollie Lewis and Tom Strudwick led to within sight of the line, but had to settle for second as the Scottish duo charged through, and the junior men’s coxless four also saw their lead overhauled by England. And there were also close seconds in the women’s doubles, the junior women’s coxed fours and the junior men’s eight. England (32 points) took the men’s team prize from Scotland (30), Ireland (25) and Wales (20), while Scotland (29) took the women’s prize from England (25) with Wales and Ireland (23) tied in third. England (25) also took the junior men’s prize, from Ireland and Scotland tied on 16 points and Wales (13), and the junior women’s title with 23 points from Ireland (19), Scotland (18) and Wales (10). A race for men’s Para scullers contributed points to the overall team standings for the first time ever, won by England’s Scott Jones, but Wales’ Luke Jones from City of Swansea Rowing Club had to bow out mid-race with a technical problem with his boat. “The race plan was to stick with the pack and then make our move, but we were up pretty much straight away.We handled the conditions really well and kept it long. It definitely tastes even sweeter that we’re a scratch boat. It just shows that we really wanted it and were prepared to really work together. It was amazing to finish in front of so many people in front of the Assembly building. 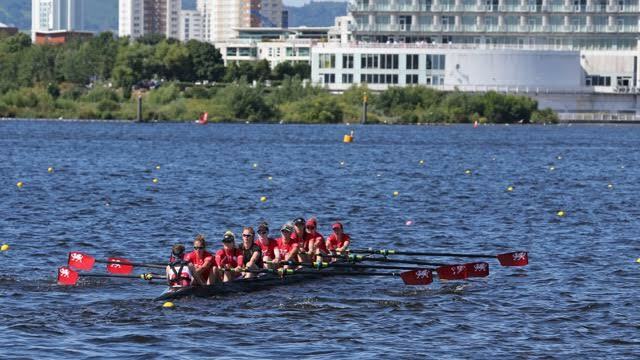 I rowed in Cardiff on the Taff for six years, but it’s my first time in Wales colours on the Bay. It’s spectacular, especially being here for six years then moving away to London. It was fantastic being up and coming into the finish in front of the Welsh Assembly, where you are much closer to the bank and loads of people were cheering Wales on. It was really good fun. We were a scratch boat and only had one outing the day before, one lap of the track, which makes it even sweeter. We led off the start and it felt pretty sharp, and then made sure we controlled the field from the front through the middle of the race. We gave it everything to keep the others away and then we hit this great atmosphere at the finish where the water calmed down quite a bit. It was great. You couldn’t be more in the heart of Wales than Mermaid Quay. I rowed just round the corner on the Taff as part of the Welsh Academy for two years, but never really rowed on the Bay, and it’s amazing. It was great. I’ve never done the HCI before or rowed for Wales, let alone in Wales. We got off really smoothly and had a controlled strong middle, and then we were in a great position to enjoy the cheering at the finish. It’s a great experience representing the country of my birth for the first time on home water and in such a great location as Cardiff Bay. We said draw it off the start and get the pressure down, and after about 10 strokes we were pulling away. It was really choppy with the riggers going under, but we coped with it really well. They’re very strong girls, and we dominated it. We expected as a scratch crew that we might be down off the start but backed ourselves to row through. Instead we were up from the go though, which was brilliant. I couldn’t see what was going on behind me race-wise which is always a good thing. And then at the end conditions got better and I could feel the girls were rowing really well. That was an absolute humdinger, coming through the England sculler right at the end to retain my singles title won last year in Scotland. It feels great, very hard, but worth it in the end. It was really choppy water, with a lot of dodgy strokes, but everyone else was in the same position. I think it rattled a few people. But in the Oxford Blue Boat on the Thames, we often sought out the worst possible water to row in, so I wasn’t too worried. It’s not a traditional way to win for me in the single scull coming through right at the end, but with Oxford we did a lot of that sort of practise, of being down and pushing past. I had a bad start, and with the crosswind was about 45 degrees off course just before the starter said go. I was about a length and a half down before I started racing. I had a quick look at half way, and the English sculler looked pretty comfortable. But I kept creeping back and had got back to a length with 500m left, and then really attacked and took him by surprise, pulling level in about 10 strokes, and then it was an all out sprint to the line. I thought I had about a canvas but wasn’t sure until the result was given out. I felt a bit of pressure beforehand, as I’ve never failed to medal in my four previous Home Countries and Commonwealth appearances for Wales. The finish is really great, loads of people, more than any other Home Countries Regatta. It’s an amazing location, really accessible, in the heart of the Welsh capital. We had a restart, I’m not exactly sure why, and was third the second time away behind Ireland and England, and then began to move through in the middle. I got about a length or so up, but you can’t ever think you’ve got it until you cross the line, especially in such rough conditions. It’s a great place to race in my first appearance in Wales colours and fantastic to win. This is my fifth Wales appearance and it feels fantastic to finally secure a win after some close seconds, particularly on home water. It was really choppy on the start, but after being blown all over the place in my single we got it just right pointing the boat into the crosswind, and when the starter said go, we’d drifted right on line. We had clear water at 250m gone and then just kept building more and more. After half-way, we just made sure there were no shipwrecks in the rough stuff. Then there was a lot of noise coming to the line from people cheering us on. The others were racing for second, so we had to be aware, but held on for the win, and then we got over the line and I punched the air. You couldn’t be more in the heart of Wales being cheered on by the home crowd it was amazing. We’re a scratch boat and that makes it even better. We went off nice and hard and got onto the rhythm and moved on and just kept squeezing through the middle. It’s definitely one of the best locations to race in. The spectators watching are right on top of you, and it’s great being cheered on by a home crowd in the middle of the Welsh capital.